Oxidising agents are substances that can help fires to burn. Paper will burn in any direction, but if an oxidising agent is soaked into it, the paper will burn best there. Sodium nitrate is an oxidising agent. Sodium nitrate solution can be painted onto absorbent paper and left to dry. A smouldering taper will set the paper on fire where the dried sodium nitrate is, and the paper will burn along the lines you have painted. Lots of fun, lots of smoke, and very smelly! The sodium nitrate solution must be fully dried on the paper before fire writing starts. It will not work properly otherwise. It is useful to take a break between the two parts of the activity. Measure 10 cm3 of distilled water into a beaker. Add a spatulaful of some sodium nitrate and stir with a glass rod to dissolve it. Repeat until no more will sodium nitrate will dissolve. With a small paintbrush, write a message or draw a picture on a piece of paper using the sodium nitrate solution. Make sure you use joined-up writing, and don't complete any loops. Leave the paper to dry completely before the next part. Light a wooden splint, then gently blow it out so that the end is just glowing. Touch the glowing end to the start of your message or picture until the treated paper starts to glow and char. You may need to tilt the paper so that the charring continues along your painted line. Fire writing is very easy to do, but you must be careful. It works best on absorbent paper such as sugar paper, and students seem to prefer to draw a message or an image in pencil first. The sodium nitrate solution should not be used too sparingly; otherwise it can be difficult to sustain the smouldering lines. The paper must be dry before attempting to ignite it. The fire writing will not work properly if the painted line is still damp. If you can't wait for the paper to dry naturally, use a warm hair dryer to speed up the drying process. If the fire writing seems to be burning too slowly, it can help if the paper is held almost vertically. However, care must be taken so that it doesn't burn too vigorously – it can burst into flames unexpectedly. Similarly, care must be taken when disposing of burnt and unburnt paper at the end of the session. Fire writing produces a lot of smelly smoke, so ensure good ventilation in the lab. Solid sodium nitrate(V) is oxidising. 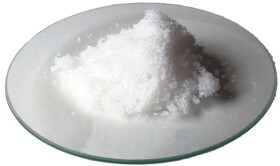 Sodium nitrate solution is harmful if swallowed, and irritant to the skin, eyes and respiratory system. Wear eye protection and ensure that the lab is well-ventilated.